One of my favorite details in my cover is the gorgeous, evocative Celtic heart rope knot. It's so beautiful, and I love how much it symbolizes Avery's life and struggles. With Valentine's Day coming up, I decided to try making some of my own Celtic heart knots to hang up as decoration, and I thought I'd share this DIY with you! These knots make beautiful necklaces, bracelets, and charms to hang on your bulletin board or wall. Enjoy! 1. Start with a piece of rope or yarn. Plain white cotton rope works best, but you can also use shoelaces, hoodie strings, or, for teeny-tiny knots, embroidery floss. Somewhere in the depths of my apartment I have some pretty white cord, but after searching for 20 minutes and coming up empty, I went with some pretty white yarn. 2. Keep most of the slack on the right end of the string; this is the end that will do the tying. The left end of the string will pretty much stay in the same place. 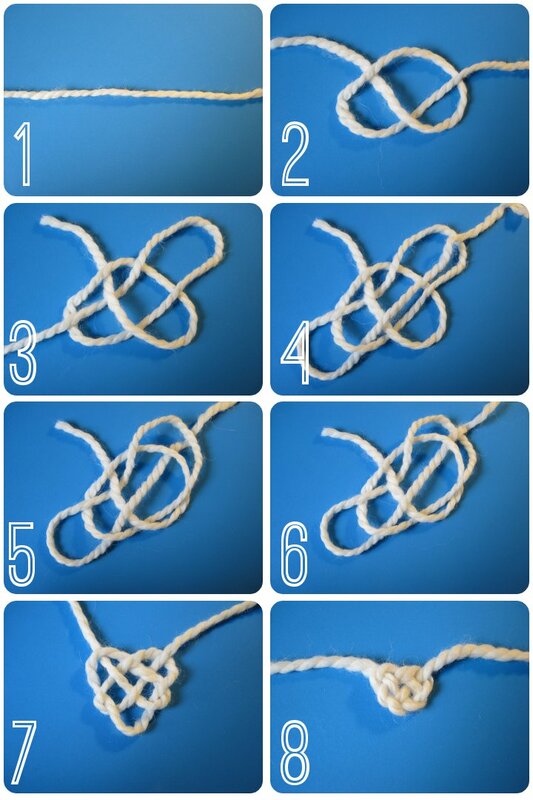 Tie a simple overhand knot (this is the kind of knot you make when tying your shoelaces. Hey, you just learned something new!). 3. Take the right end of the string and weave it under the middle cross string. 4. Now take that same end and weave it under the first loop and over everything else. 5. Take the end and weave it under the top two loops. 6. Take that end and weave it over the last loop. 8. ...Continue to pull the ends of the string for a tighter, smaller knot. And that's it! I hope you enjoy making a Celtic heart knot! I'd love to see pictures of your creation, so after you're done, tweet or email me a photo!